Kino on Video Web site. Long before Cecil B. DeMille made The Ten Commandments and The Greatest Show on Earth, he filmed dozens of silent movies. Some of the best of these silent movies are now being released by Kino on Video as part of a six-cassette series, "Cecil B. DeMille: The Visionary Years, 1915-1927," produced for Kino on Video by David Shepard of Film Preservation Associates in cooperation with the DeMille estate and the George Eastman House. 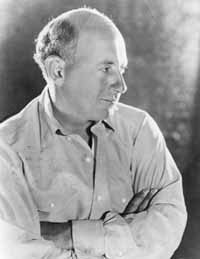 Cecil B. DeMille (circa 1923). In the silent era, DeMille reigned as one of the most widely respected directors. Wearing riding boots and breeches, he controlled his sets like a dictator and became widely associated with images of the stereotypical tyrannical director. His movies are frequently filled with amazing scenes of grandeur and opulence, such as the frequent bathing scenes, where he filmed the bathing rituals of the rich, elevating simple bathing to an art form, and preserving modesty with carefully placed screens and colored water (look no further than the first few minutes of Male and Female for an example of this, with Gloria Swanson as the bather). While DeMille is largely remembered for the opulence of his productions, he actually gave us many types of films. The Volga Boatman is an exciting action melodrama played out against the Russian Revolution and The Whispering Chorus is a film noirish tale of one man's descent into his own personal hell. And in Carmen, DeMille also delivers a story quickly and compactly (in only 59 minutes), unlike the mammoth running times of his later productions. 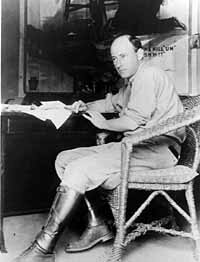 Cecil B. DeMille (circa 1918). DeMille's reputation has dropped significantly during the past 30 to 40 years. Yes, his movies do frequently opt for big scale superficial treatments of their subjects. DeMille preferred to suggest deeper meanings by simply contrasting unlikely stories from different periods (look to the strange Babylonian flashback sequence in Male and Female for an example). He also gave us huge historical treatments that plodded forward like dreadfully overweight dinosaurs (see Joan the Woman). But DeMille played an important role in the development of cinema and his influence should not be underestimated. His grand scaled approach to cinema helped to suggest to early audiences that film could be artistic (think of museums). And with movies such as The Whispering Chorus, he suggested innovative approaches to filmmaking. These videos serve an important role by reaquainting us with this underappreciated period in DeMille's career.